Submitted by Hippytea on January 20, 2015 – 2:04pm. Combine, stand for 30min. Knead, 10min by hand or 5min in mixer (speed 1). Shape and place in greased loaf pan. Let rise 3-4 hours, until not quite doubled. Score or snip with scissors, place in cold oven with 1 cup cold water in pan on bottom, set to max, bake 30min. Remove from pan, return to oven, reduce temp to 180C, bake until it knocks hollow on the bottom (10-20min). As I mentioned in my previous post, this is a hacked-about version of James Morton’s basic sourdough recipe. It amounts, if you do the maths, to a basic lean white loaf at 75% hydration, with quite a high starter content. “But,” I hear you cry, “you can’t produce proper sourdough without the proper fermentation times/slap and tickle/whatever!” No doubt you’re right – but I did warn you to look away! The thing is, this recipe is not intended to produce an optimum loaf. What it’s intended to do is let me, as an utter sourdough beginner, produce consistently edible bread within an easy timescale, while slowly learning how the starter affects the handling of the dough, how it rises, and so on. 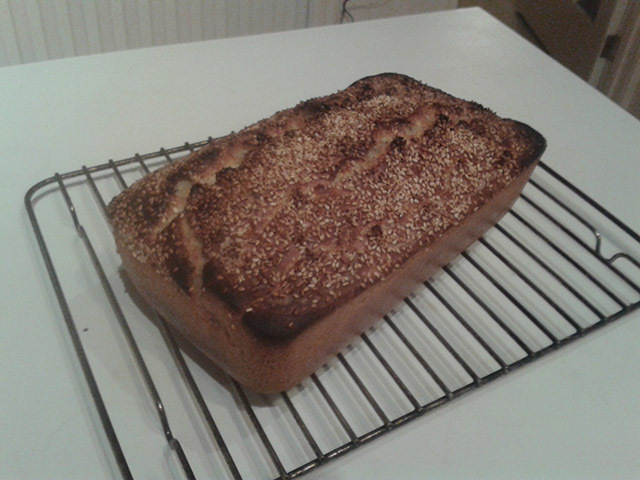 I’m someone who gets hugely discouraged if I produce a bad loaf; to keep my motivation I need most of my experiments to produce something which can be buttered and consumed. So far the butterability strike rate is 100%. So far I’m intrigued, puzzled, and enchanted. It’s been a long time since I felt this far in-over-my-head while baking. I don’t know where to start with handling this dough. It’s very wet, and very weak. It seems to lose cohesion very quickly, as if it were over-kneaded, but 10 minutes doesn’t seem like much. I can handle it – just – and shape it, but it doesn’t feel strong at all, and it puddles out as it rises. I have only tried adding a bulk ferment once – it survived, but I worry in general that it might just suddenly lose structure. Perhaps it’s just the hydration – 75% doesn’t seem that extreme (I’ve made quite a few loaves at that hydration with instant yeast – I’m a high hydration fan) but it just doesn’t seem to be holding up. Maybe my starter is wetter than I think, though I do weigh in the feedings. Or maybe it’s just that I live in a damp old house in a damp corner of the damp and soggy West of Scotland, so my flour is already saturated. Whatever the cause, I think I need to back off on the hydration and see if that helps. I’m studying with my brain as well as my hands, but however many threads, blogs etc. I read, I can’t quite get a handle on all the many, many parameters involved. Acidity, proteolysis, acetone smells, inoculation, preferments, builds, and on and on and on. This is going to take a lot of time. – #1, it was ABSOLUTELY BALTIC FREEZING in my house, so this thing took about seven hours to double. – #2, I have cracked a nail into the quick. What does #2 have to do with baking? I hear you say. Only that I have it strapped up with surgical tape, and jamming a thumb covered in surgical tape into bread dough grosses me out. I can’t take the tape off or the dough will get trapped in the cracked nail, which grosses me out even more. CSI gloves are the only possible solution, but I don’t have any. So, long story short, I couldn’t knead today, nor shape. The mixer took care of the kneading, but its shaping skills are dismal (it promised it would practice, but I don’t think it can be bothered. Lazy kitchen robot). In the end, I gave up and just poured the wet, weak, unshaped dough (batter?) into the pan. Have you ever wondered what the results would be if you just didn’t bother to shape a high-hydration dough at all? Behold. 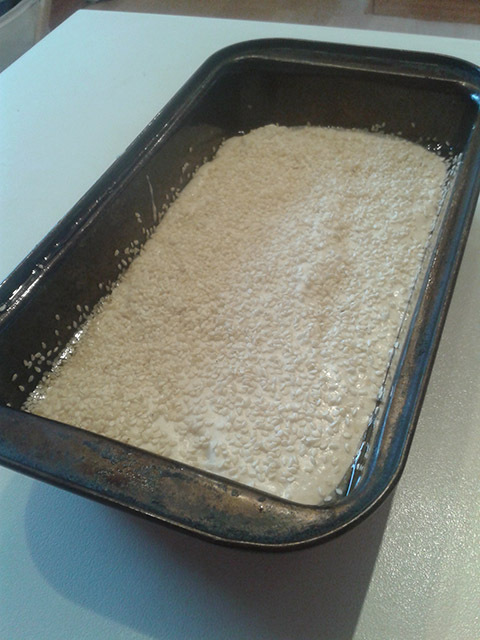 Pre-rising: a sesame-coated puddle. Post-baking: an unnaturally shiny, pointy-cornered loaf. It’s not heavy – it’s risen pretty well. I’ll be interested to see what the crumb is like, but it hasn’t quite cooled yet. An update will follow. I know my path to sourdough wisdom is a slightly odd one, but it’s working for me. Perhaps it will help someone else. At the very least my flailings might be funny to watch. As for me, as long as I can spread butter on the results, I’m happy enough. « Large Proofing Box from a Broken Fridge or Freezer?